The family gathers around the wreath (which is not yet lit). A purple (blue) candle is lit the first night and all of the first week. 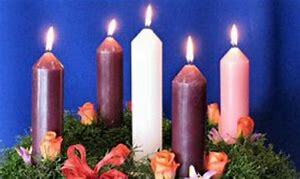 During the second week, an additional purple (blue) candle is lit, during the third wee, the rose(pink) candle is lit, and on the fourth week, all four colored candles are lit. the central white candle is lit on Christmas Eve and Christmas Day. Families may divide responsibilities for leading the service, lighting the candles, and reading scripture so that everyone may have a turn as they are able. An individual will want to omit the portions which call for a response, while following the outline for the remainder of the service. Use the appropriate prayer from the list in the next column. The candle or candles may now be lit. All may exchange the peace. Leader: The Lord bless us and keep us. Amen. the Lord make his face to shine upon us and be gracious to us. Amen. the Lord lift up his countenance upon us and give us peace. Amen. Put out the candle or candles.